If you grew up a Red Sox fan in the 1970s, you dug No. 19, Fred Lynn, end of story. When I see this card, I see Lynn in his golden Red Sox heyday. He made everything look cool and effortless — even jogging in from center field between innings — and those were crucial characteristics to a shy and occasionally coordinated 8-year-old. Dan Shaughnessy once wrote that Lynn was our DiMaggio, and he didn’t mean the fine player who was our DiMaggio, you know? Lynn fielded with elegance, fearlessness, and a knack for the spectacular. His lefthanded swing was the kind that made hitting coaches love their jobs, and when he got a hold of one, his home run trot — head always down, right elbow tucked close, just a hint of a bounce in his step — was casual and matter-of-fact and . . . well, again, cool was the right word. Of course, cool was also part of the problem, as were a couple of other adjectives in that previous paragraph, starting with effortless and casual. Lynn made it look so easy that the assumption, accurate or not, was that it was easy, and so when he began missing time with injuries that didn’t seem particularly debilitating when Upton and Lobie were talking about them on “Calling All Sports,” that’s how a reputation (and perhaps an accompanying nickname) is born. And so Fragile Freddy it was. I was reminded of this not only because of that baseball card, but for a different reason, and one that is probably apparent at the moment. Jacoby Ellsbury, who returned to the disabled list with re-injured ribs and a bruised reputation, is the latest Red Sox outfielder to be slapped with vague but mounting accusations of having a low pain threshold or being unwilling to play when he’s less than 100 percent. Whether criticism of Ellsbury is fair or not remains to be determined. His manager’s previous comments about his responsibility to his teammates, to paraphrase slightly, indicates at the very least that there’s been a perception that he’s put his own well-being ahead of his team’s. But it’s not difficult to see the situation from Ellsbury’s perspective as well. He’s a player who depends more than most on sheer, world-class athleticism, whether he’s tormenting pitchers and catchers on the basepaths or making spectacular catches in the outfield. And he did crack four ribs. Such an injury might test Jack Youngblood’s pain threshold. Anyway, retracing our winding steps from Ellsbury back to Lynn here, it is interesting to consider a curiously significant number of talented and productive Red Sox outfielders through the seasons who have endured whispers that they were malingerers, from Reggie Smith to Lynn to Ellis Burks to, nowadays, J.D. Drew and Ellsbury. Even more interesting is that Smith and Burks are two of Lynn’s all-time most similar players according to baseball-reference.com. Smith rates first on the list among all big leaguers, as well as at ages 37 and 38, while Burks is Lynn’s top comp from ages 32-35. I’d never thought of the parallels of their careers — I was expecting Drew to appear somewhere on Lynn’s list, but not Burks — but it makes a ton of sense. Both played hard yet made the game look easy, and both were made well aware of the fans’ frustrations when they weren’t on the field. Not coincidentally, both eventually moved on. 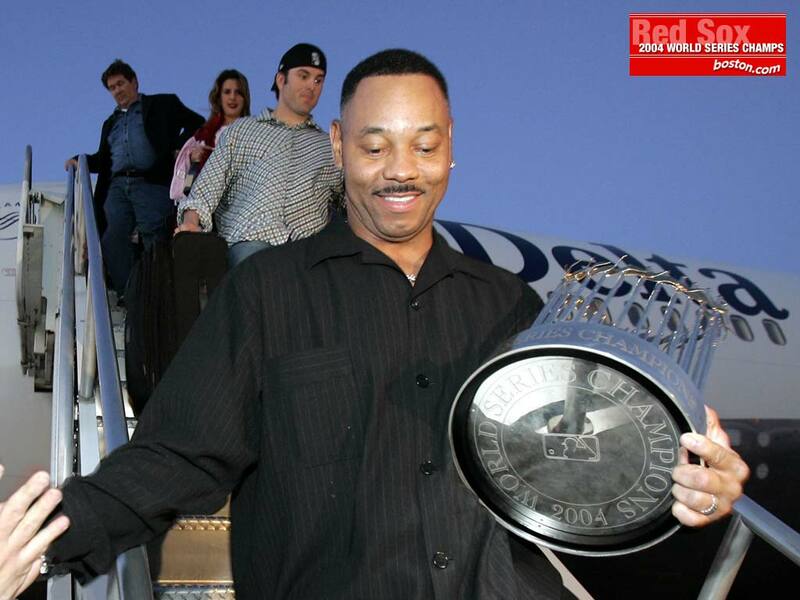 While Burks went on to achieve great things elsewhere — check out his beastly .344/.408/.639 line (with 40 homers) for the 1996 Rockies — before returning to make the most memorable airplane exit of all-time with the 2004 Sox, Lynn was never quite the same after leaving Boston (and Fenway, which was tailor-made for his swing) in a particularly horrible trade in January 1981. Once the trade was to be for Steve Howe and Joe Beckwith, two young Dodger pitchers of great potential, plus minor league slugger Mike Marshall. And it sounded OK, because the Red Sox needed young pitchers of great potential. Then the trade was to be for Yankee ace Ron Guidry and outfielder Ruppert Jones. Though the thought of Fred Lynn roaming center field for George Steinbrenner caused strange rumbles in the stomach of the average Red Sox fan, it would at least have been talent for talent — the best for the best. But now the actuality is less, much less. 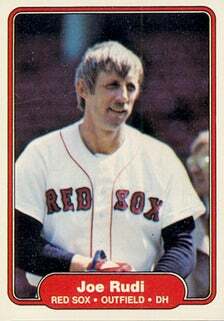 Lynn, one of the top players, if not the very best in the game, has gone from the Red Sox to the California Angels for fragile outfielder Joe Rudi, tender-armed lefthanded pitcher Frank Tanana and undistinguished minor league hurler Jim Dorsey. It was a trade of desperation and expediency, brought about by the entanglements of modern baseball and the failure of the Red Sox front office to stay a step ahead of these entanglements. Haywood Sullivan was in a bind, much of it apparently of his own making. Yesterday Sullivan was in New York at a hearing in which Lynn was claiming he should be a free agent. If the arbitrator ruled in favor of the outfielder — and the betting was good that he would — the Red Sox would lose Lynn and get nothing in return. And so the trade. A year ago, if the Red Sox had even whispered that they were thinking of trading Lynn, a graceful outfielder, high-average guy and home run threat, for the struggling Tanana, they’d have been run out of town on a rail. Better than nothing. That’s all Fenway fans are left with as exchange for a player who someday could wind up in baseball’s Hall of Fame. Better than nothing. 2. It was a trade of desperation and expediency. . . . . . and one that brought predictably hideous results. Tanana, coming back from an arm injury, worked through the hiccups of making the conversion from brash flamethrower to wily junkballer during his one season in Boston, with discouraging results. He went 4-10 with a 4.01 ERA in 1981, then signed with the Rangers the following January. And he was the best thing the Sox got in the deal — Rudi batted .180 with a .591 OPS in 49 games, and Dorsey appeared in four games over two seasons, with a 16.88 ERA. He was no Joe Beckwith. 3. Lynn, one of the top players, if not the very best in the game . . . That perception was the reality at times with Lynn in Boston. We all know about the gold-dusted summer and fall of ’75, when he became the first player to be named MVP and Rookie of the Year in the same season. And in ’79, after he spent the previous winter working out on those new-fangled Nautilus machines, he was the very best in the game, leading the AL in batting (.333), on-base percentage (.423), slugging (.637), OPS (1.059), OPS+ (176), and finishing second in homers (39) and fourth in RBIs (122). He finished just fourth in the MVP voting, probably because the 91-win Sox wound up third in the AL East. But he had seasons where his numbers were surprisingly pedestrian. He followed up his dazzling rookie season with 10 homers and 65 RBIs in 566 plate appearances in 1976. He followed up the ’79 masterpiece by hitting 12 homers and driving in 61 runs in just 110 games. He never played more than 150 games in a season, in four of his six seasons in Boston he drove in fewer than 83 runs, and he never led the league in another offensive category after ’79, his age-27 season. I guess you don’t have to do much scouring to find reasonable sources of frustration for his fans. To Lynn’s credit — and I’ll wrap up what was supposed to be a whimsical, nostalgic, and quick post three days ago momentarily here before it becomes the The Official And Mind-Numbing Encyclopedia of Frederick Michael Lynn — he’s always been accountable for his career. Aging as gracefully as he played, Lynn strikes you as someone who has no regrets, yet he easily admits leaving Boston wasn’t the best career move. That .347 career batting average at Fenway might have something to do with that. We’ll give the last word on our overwrought ode to Freddy (and a 30-year-old baseball card) to the man who played to his left for six full seasons. Dewey remembers him well. 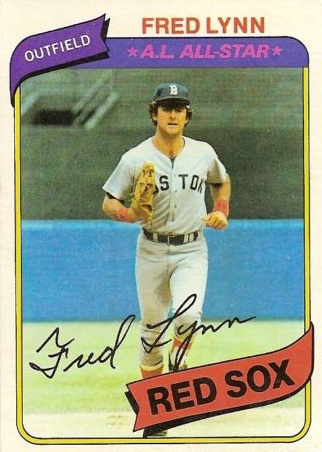 And despite Fred Lynn’s enigmatic ways, he’s far from the only one. There are far worse baseball legacies to own than one of uncommon grace and unsustainable greatness.